This Swordfish 1500XCD Cross-Cut Shredder can shred up to 15 sheets of 80gsm paper at a time. 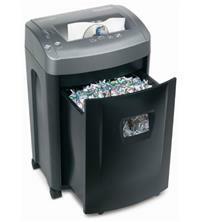 It’s suitable for either home or small office use and will shred an A4 sheet into approximately 625 pieces. It has a P-4 DIN security rating, producing a shredded particle size of 4 x 25mm (making it suitable for highly sensitive and confidential shredding). The shredder comes with a number of handy features including bin full alert and auto-reverse (to help stop jamming). Castors mean that the shredder can be easily moved and the slide-out waste bin has a 30 litre capacity (holding approximately 525 sheets of shredded paper). In addition to paper, the Swordfish 1500XCD will get through staples, paper clips, credit cards and CDs/DVDs - so it is a great all round machine, whatever you need to shred. Duty cycle is 3 minutes shredding, followed by a 20 minute cool down period, allowing you to shred up to around 300 sheets per cycle. Manufacturer warranty on the Swordfish 1500XCD 15 Sheet Cross-Cut Shredder is 2 years for both the shredder and cutting blades. Still undecided about which shredder is best for you? If you are interested in Swordfish Shredders, but still aren’t sure which one is right for you, you can visit our Swordfish shredder brand page and use our handy ‘Compare’ tool to compare up to 3 paper shredders at a time.